September 14, 2012  Negotiators for the Chicago teachers union and the public school system appear closer to a possible contract agreement, but the strike continues for a fifth day. Is There Progress In The Chicago Teachers' Strike? 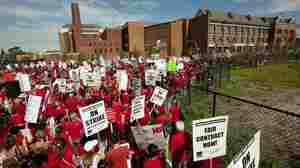 September 13, 2012  There may be good progress toward settling the Chicago teachers' strike. Both sides say they have hope school children can return to the classroom on Friday. The city offered a concession to address the union's opposition to the proposed teacher evaluation system.